Understanding the normal anatomy and physiology of the velopharyngeal mechanism is the first step in providing appropriate diagnosis and treatment for children born with cleft lip and palate. The velopharyngeal mechanism consists of a muscular valve that extends from the posterior surface of the hard palate (roof of mouth) to the posterior pharyngeal wall and includes the velum (soft palate), lateral pharyngeal walls (sides of the throat), and the posterior pharyngeal wall (back wall of the throat). The function of the velopharyngeal mechanism is to create a tight seal between the velum and pharyngeal walls to separate the oral and nasal cavities for various purposes, including speech. 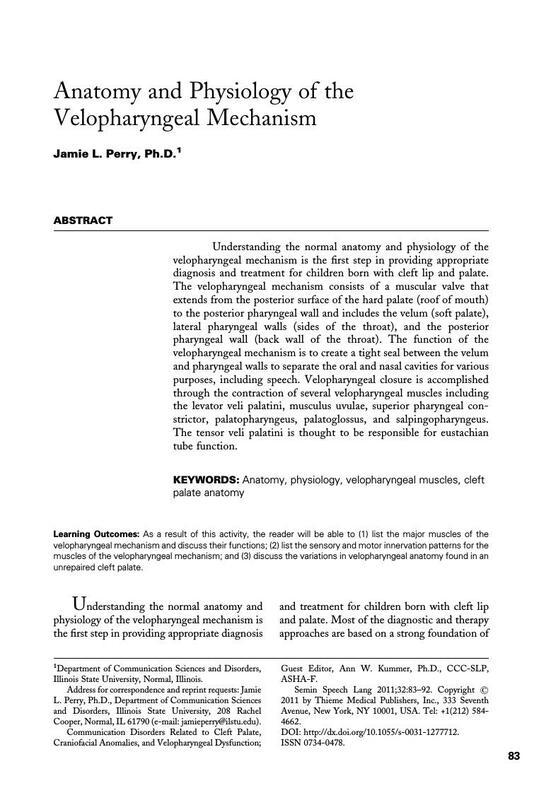 Velopharyngeal closure is accomplished through the contraction of several velopharyngeal muscles including the levator veli palatini, musculus uvulae, superior pharyngeal constrictor, palatopharyngeus, palatoglossus, and salpingopharyngeus. The tensor veli palatini is thought to be responsible for eustachian tube function.